Is This The Perfect-Sized Mini Tripod We've Been Waiting For? The problem with most compact tripods is that while highly portable, they're really only useful for supporting lighter cameras like point-and-shoots or smartphones. But most people who'd actually need and use a tripod are probably shooting with heavier DSLRs and mirrorless cameras. 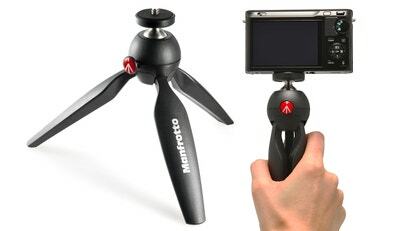 So Manfrotto created the Pixi: a decent compromise between a full-sized tripod and a compact set of sticks that doesn't sacrifice usefulness for size. Weighing in at just 227g but able to support gear up to 1kg, the Pixi measures in at just under eight inches in length with the legs folded. So while it's not the smallest tripod you can buy, it's still useful to amateur photographers shooting with semi-pro gear and a reasonably sized lens. After all, you don't want your $10,000 telephoto lens toppling the whole thing over.